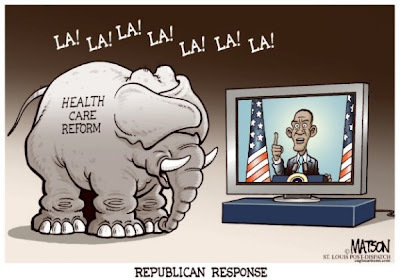 'Obstructionist' GOP Now Opposes Health-Reform Proposals Insurance Firms OK'ed! WASHINGTON -- If you were to listen to most coverage of the health-care debate, you would be excused for thinking that the so-called "public option" is the only significant difference between the parties. Republicans and Democrats are at loggerheads on a far broader set of issues. The distance between the parties' leaders on health care was made clear on Tuesday when the No. 2 Republican in the Senate held a conference call with reporters. Asked by ABC News about a package of insurance market reforms that have been endorsed not only by President Obama but also by the insurance industry, Senator Jon Kyl (R-Arizona) came out against all three proposals. In particular, the Senate minority whip signaled that he opposes reform proposals that would require insurance companies nationwide to provide coverage without regard to pre-existing conditions; require them to charge everyone the same rate regardless of health status; and require all Americans to carry health insurance. Kyl's opposition raises the possibility of a filibuster against the measures on the Senate floor, despite the Democrats' 60-seat majority that could kill off such a move. "One of the concerns I have about the approach of the Democrats ... is an assumption that there has to be a national mandate on all insurers to do various things," Kyl told ABC News when asked for his position the three issues. "Those are techniques that states can, and some have, used in the past with fairly disastrous consequences," he said. Although the public option has dominated coverage of the health-care debate, Kyl's comments underscored that the rift between GOP leaders and Democrats runs much deeper. "The more you look into [the views of congressional Republicans], the more you are going to find significant opposition up and down the board to most ideas on the table when it comes to comprehensive health-care reform," Jim Manley, the senior communications adviser to Senate Majority Leader Harry Reid (D-Nevada) told ABC News. "Republicans are betting that the president will fail." Kyl said he opposed the so-called "guaranteed issue" measure, which would require insurers to provide coverage without regard to pre-existing conditions; and a "community rating" measure that would require them to charge the same premiums rate regardless of a person's health status. The Arizona Republican opposes the provisions because of what he said were concerns about cost. "There's no question that it does raise costs," Kyl said. "And the objective here is to reduce costs." Two years ago, the insurance industry commissioned a study of states that have pursued guaranteed issue and community rating. The study, which was conducted by Milliman, Inc., an actuarial and consulting firm, found that these policies "have the potential to cause individuals to wait until they have health problems to buy insurance. This could cause premiums to increase for all policyholders, increasing the likelihood that lower-risk individuals leave the market, which could lead to further rate increases. If this continues, the pool or market could essentially collapse or shrink to include only the high risk population." The insurance industry has since concluded, however, that these problems can be overcome by requiring all Americans to purchase insurance. "If we can get everyone in the health-care system, we can do guaranteed issue, which means no denials on the basis of pre-existing condition, and no rating by health status or gender," said Robert Zirkelbach, a spokesman for America's Health Insurance Plans (AHIP), the insurance industry's trade group. Obama originally opposed requiring all adults to purchase health insurance. In fact, his opposition to an individual mandate was a flashpoint in his fight for the Democratic nomination against then-Senator Hillary Clinton, now Obama's secretary of state. Since becoming president, however, Obama has changed his stance and he now supports an individual mandate, viewing it as essential to winning the insurance industry's support for guaranteed issue and community rating. "So it's important when people ask me, why don't you do the insurance reform stuff and not expand coverage for more people, my answer is I can't do the insurance reform stuff by itself," the president said last Friday during a town-hall meeting in Montana. "The only way that we can change some of the insurance practices that are hurting people now is to make sure that everybody's covered and everybody's got a stake in it," Obama continued. "Then the insurance companies are able and willing to make some of the changes." A liberal blog publisher who's spearheading efforts to raise money for progressives who see the public option as an "essential element" of health-care reform, reacted to Kyl's comments on Tuesday by saying that it reconfirms her view that Democrats should be reluctant to make concessions to Republicans, since most of them are likely to oppose whatever bill emerges from Congress. "Democrats don't need Republicans to pass health care," Jane Hamsher, the founder and publisher of the liberal FireDogLake.com blog site, told ABC News. "The issue is going to be: 'How am I going to get health care?' Republicans are not relevant to this debate -- except if the Democrats decide to make them relevant." The Reid spokesman said that “neither the White House nor the leadership have made a decision to pursue reconciliation,” the somewhat controversial legislative process by which a bill is introduced in such a manner so that it requires merely 50 votes instead of 60 to proceed to a vote, thus removing the threat of filibuster. Manley said that “we will not make a decision to pursue reconciliation until we have exhausted efforts to produce a bipartisan bill. “By any means necessary” is a phrase popularized by the late civil rights activist Malcolm X, demanding the rights of African-Americans to be respected in society, though it is thought to have originally been penned by French existentialist Jean-Paul Sartre in his play about assassination, “Dirty Hands,” in a line demanding the end of class. Another interesting question: Even if Reid does invoke the reconciliation rule, will Senate Democrats even have 50 votes to pass the bill? You cannot start out assuming Democrats have their full 60-vote majority, since Senators Robert Byrd (D-West Virginia) and Ted Kennedy (D-Massachusetts) -- the latter a lifelong advocate for national health insurance -- are so infirm. Then take out those who have expressed reservations if not opposition to a the inclusion of a public plan: Senators Kent Conrad (D-North Dakota), Ben Nelson (D-Nebraska), Blanche Lincoln (D-Arkansas), Mark Pryor (D-Arkansas) and possibly Mary Landrieu (D-Louisiana). Then there's the open opposition to a "public option" voiced firmly by Senators Max Baucus (D-Montana) and independent Joe Leiberman of Connecticut. Now you’re down to 51. And the pressure from outside interest groups and the insurance industry hasn’t even really begun yet. On the other hand, Senator Sherrod Brown (D-Ohio) organized a letter of 28 senators -- including independent Bernie Sanders of Vermont -- demanding a public option. So do Senate Democratic leaders have the votes for a bill with a public option? Do they have the votes for a bill without one? Special Report Copyright 2009, ABC News. In the face of mounting opposition whipped up to a fever pitch by Republicans and their right-wing allies against what they falsely claim is a "government takeover" of the nation's broken-down private health-insurance system, an embattled President Obama appeared to be preparing to backtrack on what the administration has said for months is a vital ingredient in any reform of the system. The White House appears to be buckling under to a multi-million-dollar campaign by right-wing opponents hell-bent on preserving the status quo: A private, mostly for-profit, health insurance system that is excluding millions of Americans for pre-existing conditions; that is more concerned for the bottom line than for patient care and is driving more and more businesses to drop coverage for their employees or face bankruptcy. Not to mention forcing millions more Americans, unable to afford ever-rising premiums, to go without health insurance and risk incurring financially catastrophic -- and potentially fatal -- medical emergencies. OBAMA BACKTRACKING ON 'PUBLIC OPTION' PLAN? The Obama administration signaled a softening from its months-long insistence that a so-called "public option," or government insurance plan, to compete directly with the private insurance industry, is vital to the reform of the nation's health-care system. In the face of reform opponents staging noisy disruptions of town hall-style meetings held by members of Congress during their August recess; incendiary rhetoric dominating talk radio and the three cable TV news channels; with opinion polls showing the president's job-approval ratings in steady decline as the health-care debate rages on; and with mounting opposition in the Senate, Obama said in a speech in Colorado Saturday that a government health insurance program to compete with private insurers was just "a small piece" of the reform plan. "The public option, whether we have it or we don't have it, is not the entirety of health care reform. This is just one sliver of it. One aspect of it," he said. "And by the way, it's both the right and the left that have become so fixated on this that they forget everything else." Indeed they have -- and so have the mainstream news media. In a campaign filled with sensational claims and confrontational tactics by Republicans and their right-wing allies -- paid for by an unholy alliance of for-profit health-insurance companies, for-profit health maintenance organizations and the pharmaceutical industry (Of which the latter gave millions of dollars in campaign donations to congressional leaders, both Republican and Democrat, who now oppose a public option) -- reform opponents have played heavily on fears of a government takeover of the health care system, which Obama has sought to ease in a series of public appearances across the country. Yet the opponents of reform have chosen to ignore an inconvenient truth: That almost 46 million Americans have no health insurance whatsoever -- and their numbers are growing, as millions more have lost their jobs in the current recession and have lost their employee-financed health-care coverage, unable to pay the sky-high premiums in order to keep it. And the millions more Americans who are lucky enough to still have their jobs are being forced to pay more for their health-care coverage because the costs of maintaining that coverage are becoming too much for their employers to bear alone -- and have even driven major employers, such as two of the Big Three Detroit-based automakers -- into bankruptcy. White House Press Secretary Robert Gibbs said the president wanted to build and improve on the current system of employer-sponsored health insurance, while providing incentives to small businesses not to halt covering their employees, which some studies say would happen if the government provided a subsidized alternative. But in fact, many small businesses already are being forced to drop coverage because they simply can no longer afford to bear the skyrocketing costs of the present system. Meanwhile, as the anger over the Democrats' health-care reform plan is getting much attention of the media, what reform plans have the Republicans proposed? To wit, the GOP has submitted three health-care reform plans so far. Two of them have little to do with health care and more to do with tort reform -- a continuation of the Republicans' decades-long fight to curb malpractice lawsuits, which the GOP insists -- despite a lack of solid evidence -- is a "major driver" in soaring health-care costs. All three of the GOP proposals put faith in the broken-down, increasingly unaffordable, private, for-profit health-care system to clean up its act. All three GOP proposals would give people tax credits they could use to buy insurance in the individual market, if they want, similar to what Senator John McCain (R-Arizona) proposed in his presidential platform. The credits are generally $2,000 for individuals and $5,000 for joint-filers (more or less). Yet all three GOP bills contain no language that cracks down on the one thing that is driving the majority of Americans, regardless of income, up the wall the most in the health-care issue: The refusal of health insurers to cover pre-existing medical conditions. So if you buy new health insurance -- assuming you can afford to pay the outrageously high premiums and deductibles in the first place -- and you have diabetes, a heart condition, asthma, HIV/AIDS or some other pre-existing condition, you're screwed if the insurer refuses to cover it. A prominent health care and public policy think tank has sharply criticized another Republican health care reform proposal, charging that the measure "would likely fail to make major progress in reducing the number of uninsured Americans" and reduce the availability of "affordable, comprehensive coverage for many who currently have coverage." The Washington-based Center on Budget and Policy Priorities, which according to its Web site, focuses on fiscal policy and public programs that affect low- and moderate-income families and individuals, denounced the bill sponsored by Senator Tom Coburn (R-Oklahoma) and Representative Paul Ryan (R-Wisconsin) that would would eliminate the main federal tax subsidy for employer-sponsored insurance -- the income-tax exclusion for employer-sponsored insurance -- and replace it with a refundable tax credit that people could use to purchase coverage. January Angeles, who wrote the think tank's report, says that under the GOP plan, "Many employers would almost certainly drop coverage" as a result of doing away with the tax subsidy, "since individuals could get the tax credit regardless of whether they obtained their coverage through their employer or on their own." Even employers who wished to continue offering coverage "might be unable to do so," Angeles wrote, because the new tax credit "would encourage younger, healthier employees to opt out of employer-based plans, leaving older and sicker workers in the employer insurance pools and thereby driving up the cost per beneficiary of employer coverage. "Many employers might ultimately conclude they could not afford to continue offering subsidized coverage," wrote Angeles, who added that the bill "fails to address" the high cost of individual health insurance plans "that make it difficult for individuals who are older or have various medical conditions to obtain coverage. "Many of the people who would lose employer-based coverage would likely be unable to find affordable, comprehensive coverage on their own," Angeles continued. And none of the GOP proposals even begin to address the soaring cost of prescription drugs -- an issue of particular importance to seniors, even as Republicans and their right-wing allies have embarked on an outrageous campaign of fearmongering with blatant, bald-faced lies about so-called "death panels" and "They're gonna kill your grandma." Whoever came up with this propaganda ought to have his (or her) mouth washed out with soap. It's a pack of lies as outrageous as all that garbage about the president not being a native-born U.S. citizen. But then, it really shouldn't be surprising anymore: The far right has been plunging headlong into paranoid insanity ever since Obama's election. The really tragic part is that they're taking the Republican Party down with them. The time is long past for Obama and the Democrats in Congress to seek bipartisan support for their health-care bill, especially since the GOP's proposals are no reform at all and they're hell-bent on stopping a "public option" -- without which, any and all health-care reform bills won't be worth the paper they're printed on. The is time is long past due for the president and the Democrats to get tough and pass a health care reform bill with a "public option." Without it, any reform bill will be a totally worthless piece of junk that will only perpetuate the current, broken system -- and hasten America's bankruptcy. In a June editorial, The 'Skeeter Bites Report took the position -- deeply unpopular with liberals -- that a full-scale "single-payer" health-care system has no chance of passage in Congress. The inconvenient truth is that passage of a "single-payer" system would require a constitutional amendment. Why? Because the Fifth Amendment bars a complete government takeover of the nation's privately-held health-care system without the government paying hundreds of billions of dollars in compensation to private insurers -- something that both sides in the health-care debate have completely ignored. Americans already are spending $1.2 trillion on health care every year under our present private health-care system. You've got to be crazy to believe that the for-profit segment of the private health-care industry would just lie down and play dead if the Democrats had the votes in Congress to pass a public "single-payer" health-care bill. Mark my words, the industry would file suit under the Fifth Amendment to knock down "single-payer" before the ink dries on Obama's signature -- and with the conservative majority on the Supreme Court, the for-profit private insurers would likely win. No, there is only one way to force the private sector to clean up its act on health care -- and that's to employ the "Southwest Airlines Effect" and establish a public health insurer to compete directly with the private insurers. Whenever low-cost Southwest Airlines begins service from a new airport, it forces all the other airlines at that airport to lower their fares and improve in-flight service to remain competitive. One thing is certain: The existing health-care system is no longer sustainable and will inevitably bankrupt the country unless real reform is made a reality -- now.